The people of Iowa’s Creative Corridor have spoken and once again the McGrath Family of Dealerships has emerged as the industry leader. 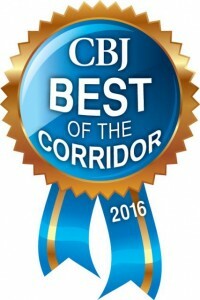 In June, readers of the Corridor Business Journal were asked to name “Best Of” in a variety or categories, ranging from Best Florist to Best Chiropractor, and of course, Best Auto Service Dealer. The McGrath Family of Dealerships was named Best Auto Service Dealer for the third time, thanks to an enthusiastic, over the top approach to customer service that sets us apart from local competition. The General Manager of Pat McGrath Dodge Country in Cedar Rapids, Murphy McGrath, credits the dealership’s Emerging Leaders program for the continued success. Recognition from the Corridor Business Journal is especially important to McGrath Auto, since it allows readers to voice their opinion in an anonymous, write-in format, that speaks to McGrath’s name recognition and value in the community. With multiple locations in Cedar Rapids, Hiawatha, Marion and Iowa City the positive feedback validates McGrath as the automotive leader in Iowa’s Creative Corridor. So what are the customer service secrets that set McGrath apart? We take feedback seriously. Whether positive or negative, any feedback is considered good feedback. Our customers tell us what we’re doing well and where we can improve, then we implement their advice to make their experience better. Training that allows our employees to provide the high level of service our customers demand, in a time efficient manner. Even in the competitive service market, they keep coming back to McGrath! It’s a family affair. McGrath Auto has been owned and operated by the same family for over 60 years. 8 members of the McGrath family hold leadership positions at the dealership and their emphasis on superior customer service continues to be valued in the community. The Corridor Business Journal has been published weekly in Cedar Rapids and Iowa City since 2004. Their readers are the local authority on business matters most affecting the people of Eastern Iowa. The McGrath Family of Dealerships is honored by the recognition and strives to one day be recognized by the Journal’s prestigious Hall of Fame, awarded exclusively to 10-time “Best Of” winners. Considering McGrath’s history of superior service and customer loyalty, the Hall of Fame is a sure thing!